In Phnom Penh, Cambodia where a prohibition on rallies is in place as well, labor activists also braved blows from the authorities, who sought to confine them with barbed-wire barricades. Family members who lost love ones when police attacked demonstrators seeking a higher minimum wage in January joined the protest, carrying portraits of the deceased. Approximately 100,000 unionists filled the streets of Jakarta, Indonesia's capital, where work stopages have been on an uptick for months. “Minimum wages in Indonesia are far behind those in Thailand, the Philippines, and Malaysia…even when living costs in those countries are relatively similar with Indonesia,” Said Iqbal, leader of the Indonesian Trade Union, told the Wall Street Journal. In Morocco, calls for higher wages were heeded, with the government announcing a 10 percent bump to the legal minimum on the eve of the workers holiday. Garment workers in Bengladesh, plagued by a spate of recent mass deaths resulting from fires and crumbling architechture in factories making goods for Western export, demanded tighter industrial safety standards in Dhaka on Thursday. Twenty-five thousand people marched in Kuala Lumpur, Malaysia where the price of basic food items has doubled over the past year after the government cut suger subsidies, a commodity in high demand. Complicating the crisis, Malaysias is heavily dependent on food imports. May Day rallies in Berlin were somewhat calmer than they have been in the past, with neo-Nazi's cancelling a planned march which in previous years had sparked violence. Neo-Nazi's did gather in St. Petersburg, Russia but neither they nor the police managed to stop members of the city's LGBT community from peacefully marching for sexual freedom. 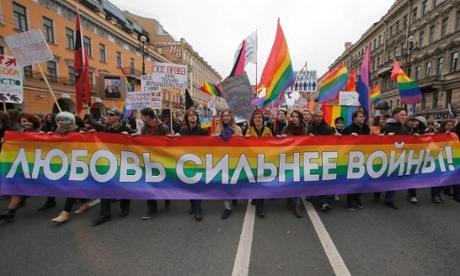 “In Russia, and in St Petersburg in particular, this holiday has for a long time been not just for workers,“ gay rights activists Igor Kochetkov told the UK Guardian. "It's the day of the year when the authorities allow all rallies and demonstrations, and so everyone comes out on 1 May, nationalists, communists, environmentalists. It's an overview of all the political views in St Petersburg." Elsewhere in Europe demonstrators pledged to fight austarity measures that governments have imposed since the world financial crisis began in 2008. 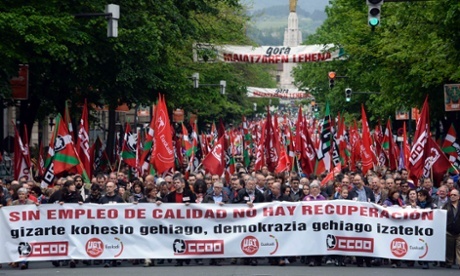 "Without Quality Employment, There is no Recovery" read the banner unions marched behind in in Bilbao, Spain. 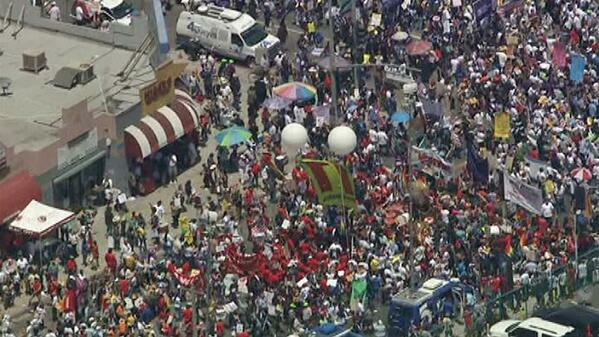 In the United States, where International Workers Day also marks a day of action for immigrant rights, System Change Not Climate Change together with 2012 Green Party presidential candidate Jill Stein joined hundreds with the May 1st Coalition in New York City's Union Square. Demands included a $15 an hour minimum wage, an end to deportations for undocumented Americans, and the right to a safe and healthy environment. Oakland and Los Angelas saw large crowds as well, while smaller demonstrations took place in dozens of other U.S. towns and cities. 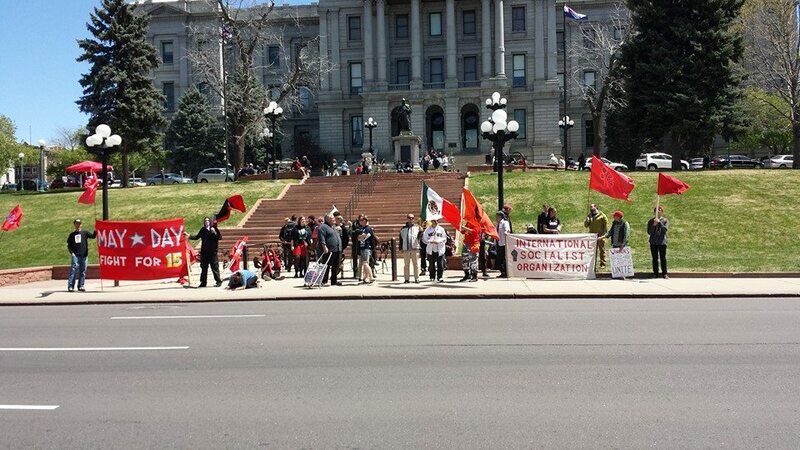 Environmental groups, including System Change, joined demonstrations in Santa Barbara, while in Denver members of Socialist Alternative and the International Socialist Organization gathered near the State Capitol Building to celebrate Workers Day. Meanwhile over on the World Wide Web, the Marxists Internet Archive was forced to meet a May 1 deadline and take down the 50-volume complete works of Karl Marx from its site, after the publishing firm Lawrence & Wishart asserted its copyright over the materials. There's a petition circulating online to get the Marx's writings back in the hands of the masses.